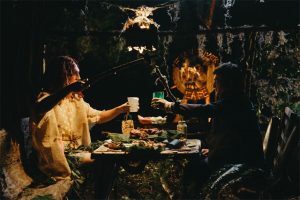 The filmmaking duo Daniels – consisting of Daniel Kwan and Daniel Scheinert – direct and write the hell out of this film, and it wouldn’t work this well without them. If you had to place the film in a particular genre, magic realism would make sense, but there’s so much going on that categorizing it is tricky; there are hilarious comedic beats abound, and in a sense, this is also a dramatic coming of age story. Whatever it can be, the Daniels make it click, and they ensure that the characters are at the heart of it. Manny (Daniel Radcliffe), the farting corpse, is certainly a gag being played for laughs, but the fact that protagonist Hank (Paul Dano) is essentially teaching him what it means to be human gives the character a complexity and warmth. With Hank, the Daniels take the story into powerful and thematically rich territory, including fear as well as the concealment of certain behaviors and qualities. A story that could be labeled as merely quirky and weird on paper becomes a meaningful tale that’s surprisingly life-affirming. The film is a wonderful thrill ride until the climax, where the proceedings suddenly and almost inexplicably escalate into the batshit insane. 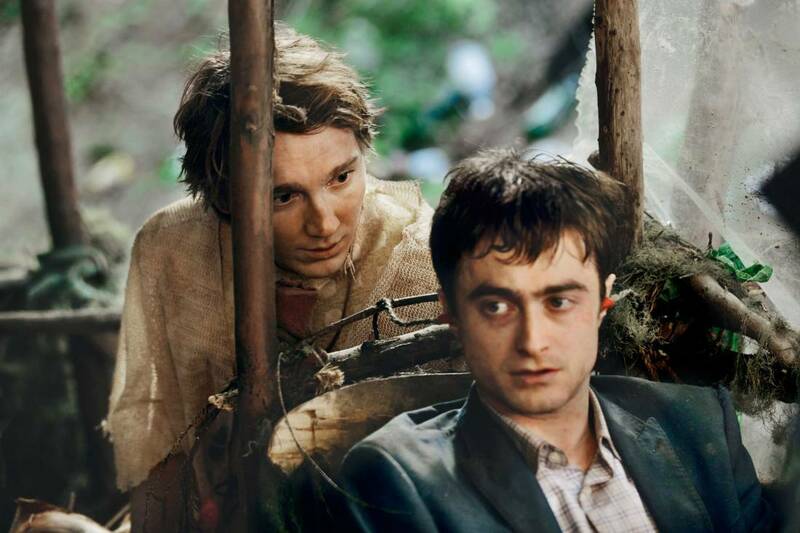 It’s up to Dano and Radcliffe to essentially carry the movie, and the two of them are absolutely tremendous. Hank is an emotionally complex character, and Dano hits all the right notes over the course of the character’s journey, from despair to joy and from eagerness to insecurity. Saddled with the challenge of keeping a flat face for most of the film, Radcliffe proves to be a tour de force, and he has certainly delivered one of the most memorable performances of the year. He recognizes that the power behind his character comes from the delivery of his lines, and he imbues that delivery with an earnestness that sells each and every emotion. With both actors on top of their game, their chemistry is an utterly delightful and honest one, and it proves key in beckoning the audience into the story. The Daniels are confident in their material, and they deserve kudos for assembling a fantastic crew to bring their vision to the big screen. 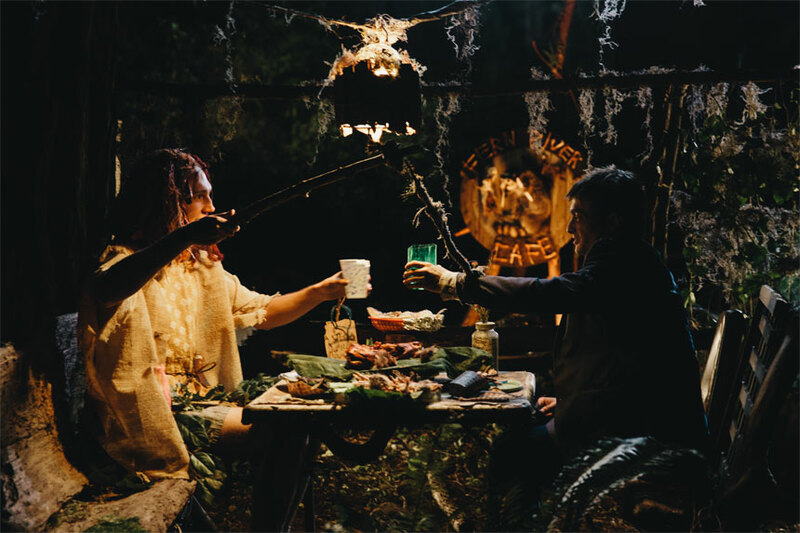 Though the story takes place primarily in the woods, production designer Jason Kisvarday conjures a number of remarkable props and sets crafted from trash and whatever lies about in such a setting. Cinematographer Larkin Seiple plays around with light and delicately frames his subjects to create some colorful and terrific images. Delivery matters as much as content when it comes to comedy, and at hand here are film editor Matthew Hannam and a sharp sound mixing crew. Hannam is nimble with his cuts and transitions, and his work allows the humor to land quite effortlessly. While the film is never a cacophony, there are a number of sounds – that mostly stem from Manny’s abilities – as well as the eccentric soundtrack to handle, and all these come together and are organized very neatly for maximum comedic effect. 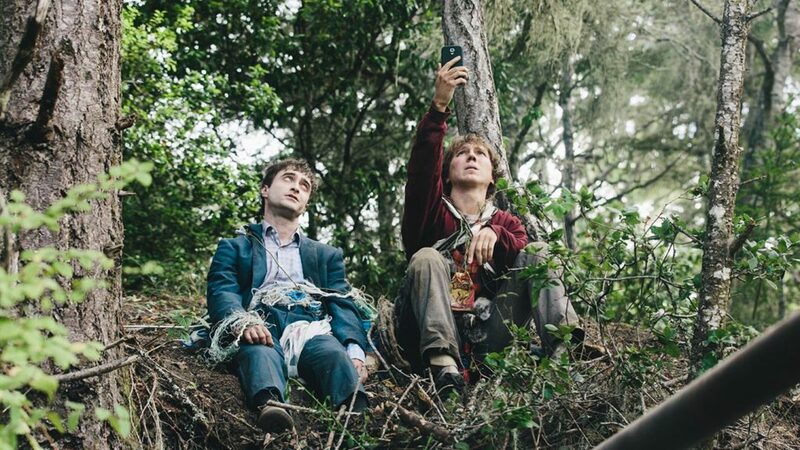 Without a doubt, Swiss Army Man is a nothing short of a unique experience. 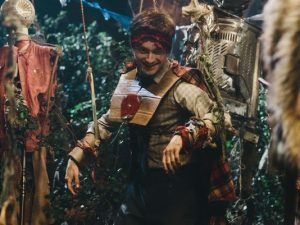 Anything and everything about it could have gone wrong, and it’s to the testament of the Daniels, the lead actors, and the crew that it soars for most of its running time. Its grasp is ultimately just a bit short of its reach, but there’s no doubt that its grasp is quite high.